there is nothing left to do, we pray. A last ditch effort; we’ve tried everything else; it’s out of our control; now all that is left is to pray. Instead, we should begin by praying, recognizing that the most powerful tool we have is Prayer. Now, we are in the best of times; we are in the worst of times. when I was a child, and I would have a nightmare. Who did I run to? prophecy, I never believed. But, it always worked! conditions and try by election to bring about reform, he was killed. he deplaned the aircraft, in front of his wife and family. their guns replaced by the armor of God, the Rosary. given you a means, a gift. All you have to do is reach out and pray. Since May is the month of Mary and she has urged us to “Pray the Rosary.” We thought we would add an excerpt from our book, “The Rosary the Life of Jesus and Mary,” on how to pray the Rosary. 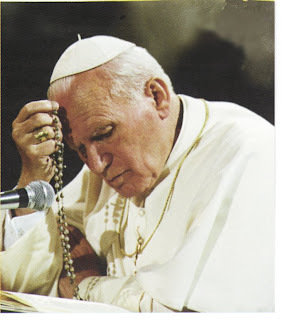 You may want to pass this on to your friends that do not know how to pray the Rosary. Wednesday and Sunday, the Glorious; or say all 20 decades each day. 5. Recite the “Glory Be to the Father”. 10. Recite the “Glory Be to the Father”. 15. Then repeat the same prayers as you meditate on all the Joyful, the Sorrowful, and the Glorious Mysteries. R. That we maybe worthy of the promises of Christ. O God, Whose only-begotten Son, by His life, death and Resurrection has purchased for us the rewards of eternal life, grant we beseech Thee, that meditating upon these Mysteries of the Most Holy Rosary of the Virgin Mary, we may imitate what they contain and obtain what they promise, through the same Christ our Lord. Amen. “I believe in God the Father Almighty, Creator of Heaven and earth; and in Jesus Christ, His only Son, our Lord; Who was conceived by the Holy Spirit; born of the Virgin Mary; suffered under Pontius Pilate; was crucified, died and was buried; He descended into hell; the third day He arose again from the dead; He ascended into Heaven; sitteth at the right hand of God the Father Almighty; from thence He shall come to judge the living and the dead. “Hail, Holy Queen, Mother of Mercy, our life, our sweetness, and our hope. To thee we cry, poor banished children of Eve! To thee do we send up our sighs; mourning and weeping in this vale of tears! Turn then, most gracious Advocate, thine eyes of mercy towards us; and after this, our exile, show unto us the blessed fruit of thy Womb, Jesus. Inspired by this confidence I fly unto thee O Virgin of Virgins, my Mother. To thee, I come; before thee I stand, sinful and sorrowful. You are currently browsing the archives for the The Rosary category.